Internationally-acclaimed land artist Chris Drury's latest project is a dry stone chamber at the end of a remote peninsular overlooking Morecambe Bay in Lancashire. 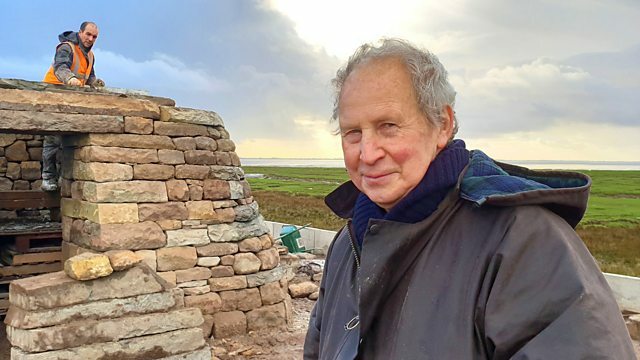 As the tide recedes, Stig brings us some 'slow radio' as he crosses the causeway and heads for Sunderland Point to meet the artist, as well as Andrew Mason, the Master Craftsman and noted dry stonewaller, as they work on the construction of the Horizon Line Chamber. When it is finished, visitors will be able to go inside the building which will feature a camera obscura projection of the vast open landscape and big sky of Morecambe Bay. Main image above, and image to the left: Chris Drury (Right) at his Horizon Line Chamber at Sunderland Point, Morecambe Bay, a Headlands to Headspace commission from the Morecambe Bay Partnership, with Andrew Mason (Left).